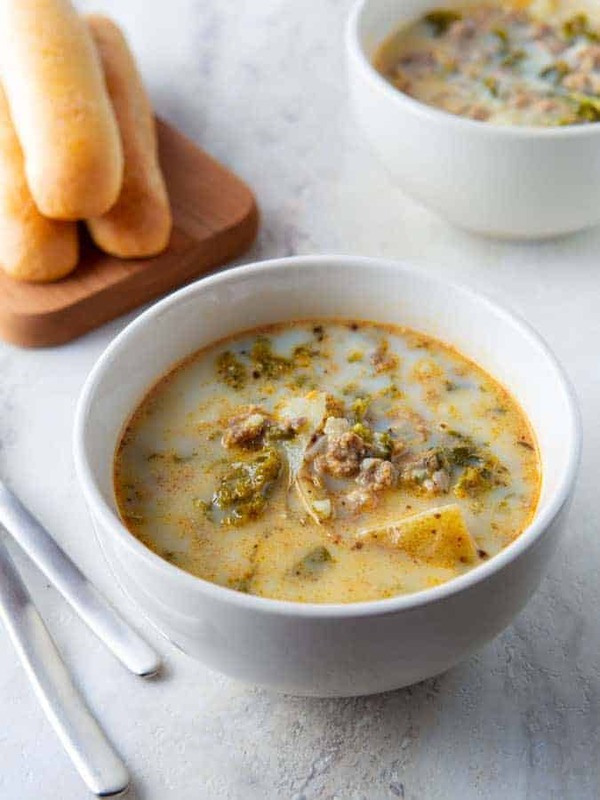 Zuppa Toscana—the sausage and kale soup made famous by the Olive Garden—is easy to make in the Instant Pot. After I posted a recipe for Instant Pot Olive Garden’s Pasta e Fagioli, several folks asked if I had a recipe for Zuppa Toscana. I didn’t. Not only didn’t I have a recipe, I’d never eaten the soup! Thank god for takeout. I ordered a bowl and I was…surprised. I expected the soup to be thick, like clam chowder. It wasn’t. The broth is thin, almost like chicken soup, with a hint of dairy. It quickly became one of my family’s favorite soups. Like the pasta e Fagioli, it’s easy to make in the Instant Pot. Sauté the Sausage. To recreate the flavor of Olive Garden’s soup, use spicy Italian sausage. If you can’t find spicy “bulk” sausage by the pound, buy links. Before making the soup, remove the sausage from the casing. To do this, make a cut in the casing with a sharp knife. Peel the casing away, discard and use the sausage as directed. Cook the Onions and Garlic Once you’ve strained the grease, return the insert to the Instant Pot. Add the diced onions and garlic and cook. This is important. Cooking the onions before starting the pressure cooking cycle adds important flavor and reduces the sharpness from the onions. Don’t skip this step. Deglaze the Pot. 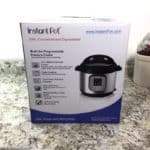 Cooked-on food can cause the “burn” warning to appear on the display of the Instant Pot. To avoid this, add 1/4 cup of chicken broth and scrape the bottom of the pot with a wooden spoon to remove any stuck on bits. Add the Remaining Ingredients. Once you’ve deglazed the bottom of the pot, add everything but the half and half. (If you add the half and half before pressure cooking, it can curdle during cooking.) Give the soup a stir and lock on the lid. Allow a Short Natural Release. 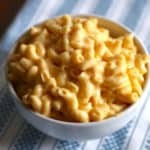 If you were to vent the pressure cooker as soon as the cooking time completed, soup could potentially spray out of the valve. To avoid this, allow the pot to cool for ten minutes before venting. Add the Half and Half. While Zuppa Toscana looks like a thick, chowder-like soup, it’s not. The finished soup is really rather thin. Stirring in a half cup of half and half adds a nice richness but keeps the thin, broth-like consistency of the soup in place. 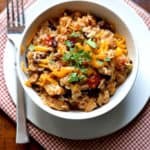 How to drain fat from the Instant Pot. Since the Instant Pot is so deep, it can be a challenge to drain fat from it. The easiest method is to use a grease strainer. Simply clip the grease strainer onto the Instant Pot, pour the grease into a heat-proof container and pour. Don’t have a grease strainer? Tilt and Spoon! With a potholder, lift the insert out of the instant pot. Place it on a heat-proof surface. Push all the cooked sausage to one side of the pot. Tilt the pot. Spoon out the grease with a ladle or place a paper towel into the bottom of the pot to absorb the grease. Yes. However, since spinach cooks so quickly, add it to the soup along with the half and half. Don’t add it to the pot before cooking or you’ll get mush. Yes! As always, check all the ingredients you to ensure they don’t contain any gluten ingredients. Can you freeze Zuppa Toscana? Yes! This soup freezes very well. To safely freeze soup, first cool it completely. The safest way to do this is to place the pot in a sink filled with ice water. Stir occasionally until the soup is cool. Once the soup is cool, ladle into quart or gallon freezer bags or containers. Label. The soup keeps frozen for about three months. The night before you’re ready to serve, place the soup in the refrigerator to thaw. Reheat over medium-low heat. How do you to reheat Zuppa Toscana? Place the leftover soup in a small pot and heat over medium-low heat. Stir occasionally. This soup rich and hearty soup makes for a filling meal all on its own. Hearty Italian bread or breadsticks. 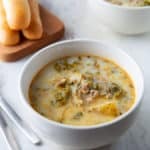 Instant Pot Zuppa Toscana Recipe. 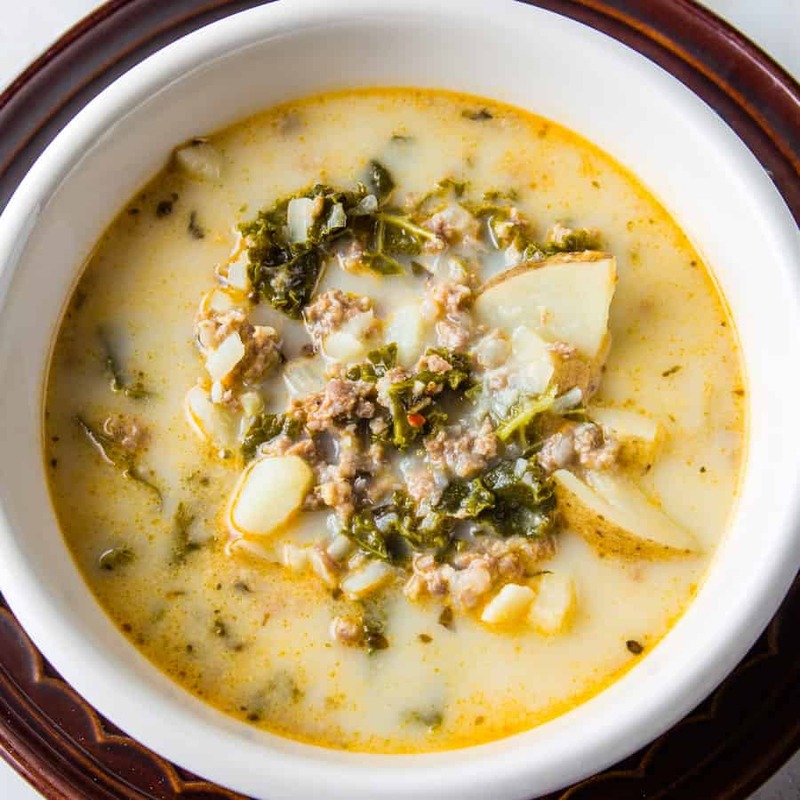 This sausage, kale, and potato soup is easy to make! Olive Garden copycat. Place olive oil in the insert of a six quart Instant Pot or electric pressure cooker. Select the saute setting. Adjust to high. When oil shimmers, add the sausage. Cook, breaking sausage up as it cooks, until no pink spots remain. Drain oil. This step is very important. Add diced onions and minced garlic. Cook for two minutes, stirring as it cooks. Add 1/4 cup of chicken broth. Scrape the bottom of the pot with a wooden spoon to remove any stuck on food. This prevents the burn notice from appearing. Add remaining chicken broth. Stir in potatoes, kale, basil, and oregano. Lock lid into place. Select high pressure (manual on some models) and set for a five minute cook time. When the pressure cook cycle ends, allow the pressure cooker to stand for 10 minutes. After 10 minutes, turn the pressure release valve to vent any remaining pressure. Open the lid away from your face. Stir in the half and half. Taste. Adjust salt and pepper as needed.